If you read my post yesterday on whether you should buy BP stock now, I mentioned how this next book to be review was very applicable and useful. With everything that has been commented on with the market, BP, and the global economy, I thought reviewing The New Coffeehouse Investor would be great. I had this book a while ago, but as I was perusing it again for the review, I kept finding myself reading the chapters and making some new notes in it. It’s still full of practical information. There is no such thing as a free lunch. (Capture the entire return of each basket, or asset class, through low cost index funds). Schultheis passionately argues that the hype of Wall Street to keep buying and selling is detrimental to many investors. His book shows how simplifying investments wisely can bring better returns. What I found intriguing was the typical investment behaviors of millionaires. Schultheis points out that less than 10% of millionaires think of themselves as active traders.More startling to me was a whopping 42% of millionaires in America makes less than 1 transaction per year for their portfolios. One concern for new and would be investors is how risky it seems. They see the news and wonder if putting their money into the stock market is the right move for them. How can tell when they should buy low and sell high? What metrics can they use to find out how to time the market? First off, Schultheis provides plenty of data on the historical returns of the stock market from 1926-2008. To ease potential investors’ fears, he examines five-year and ten-year returns. Schultheis persuasively argues that by comparing different investment vehicles, long term investing is not as risky as some imagine. The irony is that now index funds, once a simple concept that allowed you to follow the market has now become complicated with some marketing from Wall Street. Now some advisors in the financial industry are peddling sector index funds as the new way to invest. The Coffeehouse Investor takes you through the formation of exchange traded index funds (ETFs) and how they stack up against a total market index fund. If you’re looking for a guide on how to invest that can give you solid returns minimizing some of the risk, this is a great book to start with. I really enjoyed looking at the track record of different investment vehicles and how they work. 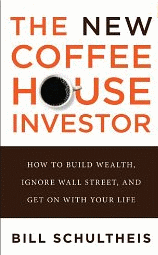 Have you’ve read The New Coffeehouse Investor? What are your thoughts on it?